What ocean creature has three hearts, a good memory, and can squeeze through a hole the size of its eye? Yep, it’s Cephalopod Week—a week devoted to celebrating the answer to that question, the octopus. And to honoring its cousins the squid, cuttlefish, and nautilus. Cephalopods, if you know your etymology, are creatures whose feet attach to their heads (Greek: kephale, for head, plus “pod” from root “ped”). They've been around for hundreds of millions of years and continue to be successful despite today’s changing ocean. But research shows us they're still full of surprises. Scientists at UC Berkeley and the California Academy of Sciences recently set out to document an octopus species that has intrigued researchers for decades. 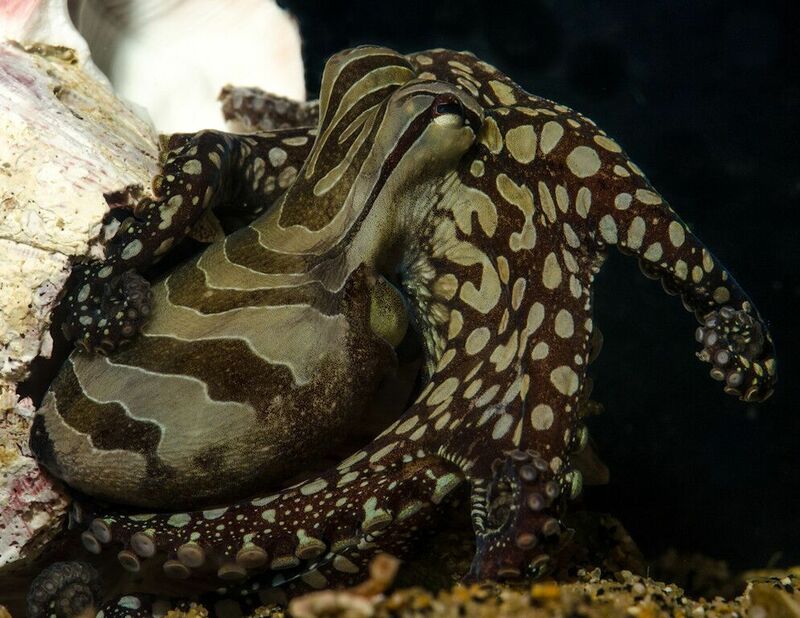 Anecdotes about highly unusual gregarious behavior among Nicaragua’s Larger Pacific Striped Octopuses (LPSO) inspired Roy Caldwell and Richard Ross to transport several of the creatures to their labs in 2012. The larger Pacific striped octopus is becoming well-known for its impressive body pattern and fascinating behavior. See the behavior for yourself in this video from the California Academy of Sciences. But sometimes you don’t need to travel far to discover new octopus behavior – you just need to dive really, really deep. 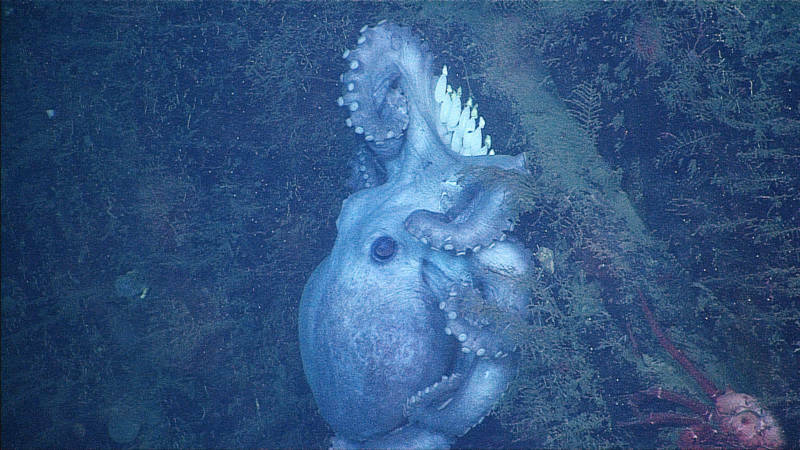 One octopus species (Graneledone boreopacifica) in Monterey Canyon (a deep ocean canyon off the central California coast) broke records when, for 53 months straight, a female was seen brooding her eggs in the exact same spot. Perched on a rock wall more than 4,500 feet below the surface, she was first spotted in 2001 when the Monterey Bay Aquarium Research Institute (MBARI) sent a remotely operated vehicle (ROV) down on a survey. She now holds the record for the longest known egg-brooding period of any animal (the elephant, admired by us mammals for its lengthy gestation period, carries her young for 22 months, less than half as long). 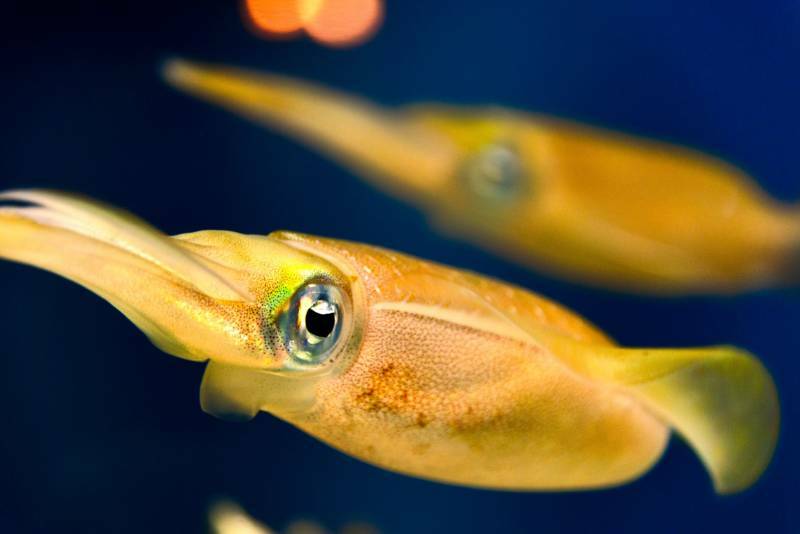 Unlike their egg-brooding octopus cousins, most squid species lay eggs and move on. 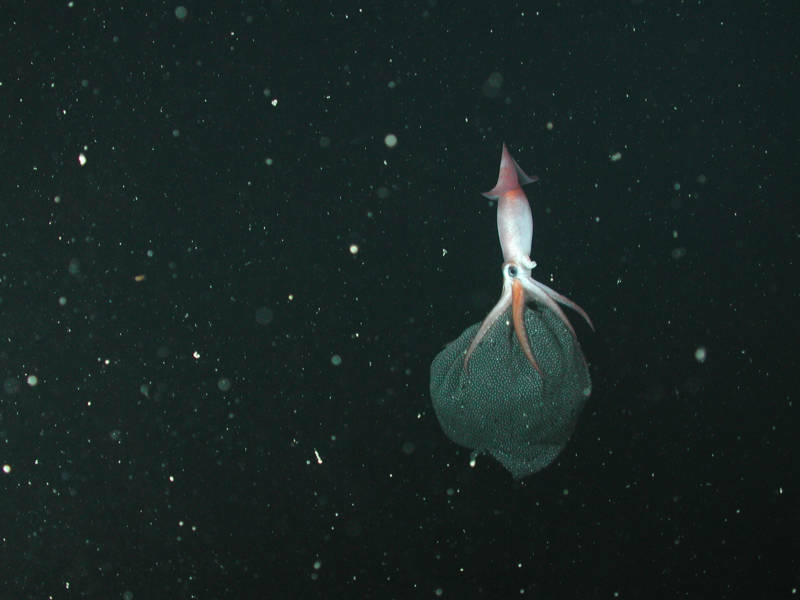 Second egg-brooding squid species discovered: There’s beautiful footage at 1:20 in this MBARI video of the only two squid species known (so far) to carry their eggs. First whole octopus genome sequenced: The California two-spot octopus (Octopus bimaculoides) recently became the first octopus to have its entire genome sequenced. See their fascinating findings in this video by Nature. Why do deep sea squids make ink? MBARI postdoctoral fellow Stephanie Bush explains the potential reasons in this Science Friday video. 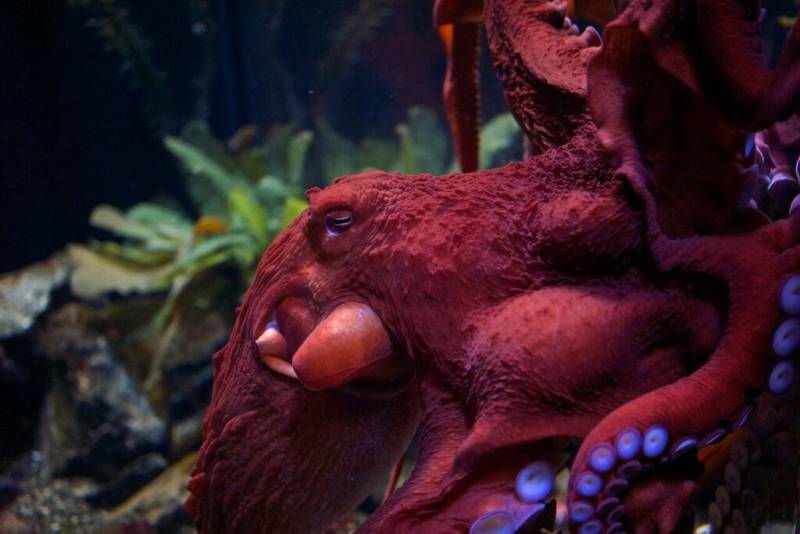 Want to celebrate Cephalopod Week by seeing some in person? 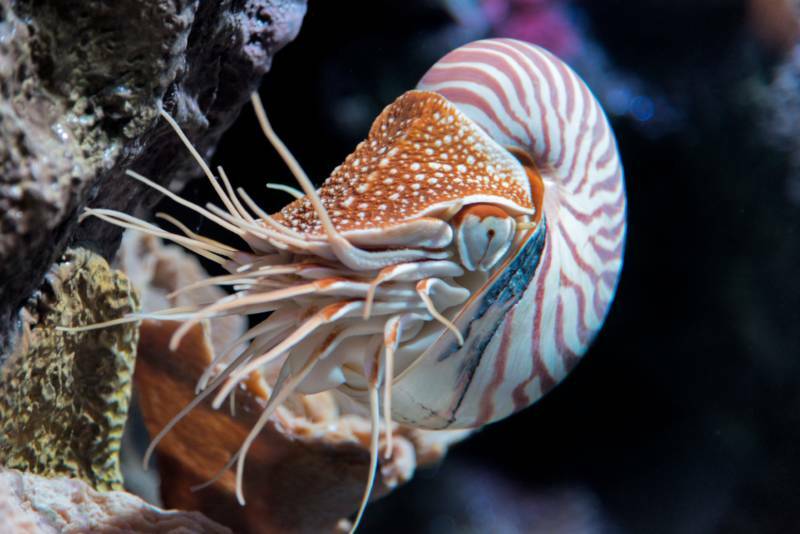 Visit Monterey Bay Aquarium’s Tentacles exhibit, catch a daily squid dissection at Aquarium of the Bay, or see the Larger Pacific Striped Octopus at the California Academy of Sciences.